Why create a New Student Precinct? The University is committed to supporting the contemporary needs of our students, with over 40% of students now studying south of Grattan Street, an increasing number of international students and 50/50 undergraduate and postgraduate cohort. Working closely with the University of Melbourne Student Union (UMSU), Murrup Barak, Graduate Student Association (GSA), in addition to student representatives across campus, the University is co-creating a New Student Precinct that will accommodate the changing necessities of an evolving student population. The current infrastructure dedicated to the student experience (outside of faculty) is also poor and currently non-compliant. Where will the New Student Precinct be located? The Precinct will be located near the corner of Swanston and Grattan Street, bordered by Monash Road and the Melbourne School of Engineering. Nine buildings are incorporated into the scope of the development and are ideally located adjacent to Stop 1 and Carlton Connect, and easily accessible to the future Parkville Train Station. Using the Engagement Framework below, the Project is currently in the Implement phase. In August 2017, the project was allocated $193.6M from the Capital Plan for Phase 1 of the Project, with a ;further $36.1M for Phase 2, subject to a further business case. Early and enabling works commenced early 2018 to prepare the site for construction works and will be ongoing until the end of 2018. In February 2018, Lyons Architecture was engaged as the lead architects. The schematic design has now been delivered and the Project Team are preparing to start the detailed design phase. More information on the design process can be found on our Design and Development page. It is anticipated that the New Student Precinct will open 2021-2022 with the University of Melbourne Student Union and their associated services and activities scheduled to relocate to the Precinct in late 2020 -2021. However, there are a number of variables that may affect the timing of the Project and the relocation of the Student Union into the Precinct. Regular updates on the progress of the Project can be found on the New Student Precinct website. What are Early and Enabling Works? Early and Enabling Works is a generic description for site preparation works that might take place prior to work under the main construction contract. Early and Enabling Works will commenced in the New Student Precinct from January 2018 and will continue until early 2019. It will involve noisy works but these will be minimised wherever possible. The project team is working with the University to run pop-ups and activations to improve the campus experience throughout this time. Where can I access up-to-date information about the New Student Precinct Project? Regular updates on the progress of the New Student Precinct Project, including the Project timeline can be found on the New Student Precinct Website at students.unimelb.edu.au/student-precinct. Is there a map to help me access buildings now the hoarding is up? A one-page map and directions to assist staff, students and visitors navigate the New Student Precinct hoarding line and access buildings is available online. The Project is committed to co-creating the Precinct with students as partners, the approach driven by design thinking methodology. Co-creation requires a commitment from both parties to engage in a real partnership to ensure mutually beneficial outcomes and benefits are achieved. The co-creation of the Student Precinct will enable students to be part of the governance, design and activation of the space, and to be consulted throughout the life of the Project to ensure their views inform decision-making, governance and the overall design. Since its inception, the Project Team have conducted multiple co-creation activities and events, engaging over 5500 students to date. 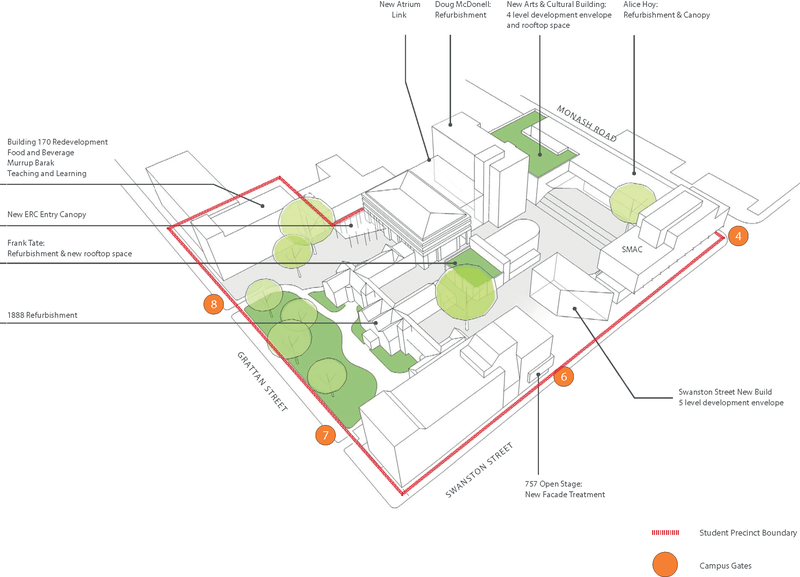 How will students be involved in the co-creation of the New Student Precinct? In 2015 plans for the Student Precinct were in an early formative stage with a commitment made to work alongside the University if Melbourne Student Union, Graduate Student Association and broader student community to co-create a new Student Precinct. This included student members being part of the Steering Committee. A quantitative survey completed by 867 students, was presented in first semester 2017, to validate and test the findings and data gathered through the Co-creation Community. An activation is an event or initiative that seeks to transform and energise a space. Activating the Precinct is a key aspect of the Project to encourage students and the wider University to both connect with the space and contribute to it through engaging and collaborative activities. What activations are coming up? What will happen to the trees in the New Student Precinct site? The Student Precinct contains a number of significant trees that will be protected and carefully integrated into the renewed precinct landscape. Large established trees bring heritage value, provide significant shade and wind mitigation, and reinforce the character of the precinct. As such, preservation of existing significant trees will be a priority, and all works around significant trees will be overseen by a qualified arborist. Significant trees in the Precinct include, but are not limited to, the giant London Plane tree in the Tsubu courtyard, the Lemon Scented Gum behind Sidney Asia Centre, and the trees in the 1888 Gardens. Why is the John Smyth Building scheduled for removal? Replacing the John Smyth building, which has poor public interfaces on all sides and little heritage significance, will enable a new building to engage with Swanston St, down the line. Furthermore, early removal of the John Smyth building will allow access to the site from Swanston Street during the build. What will happen to the Frank Tate Building? The Frank Tate Building will be refurbished to its former glory and take a prominent position at the heart of the New Student Precinct. With a significant drop in the ground plane, the building will have more visibility and increased access, establishing Frank Tate as a central point of orientation. What is planned for the Eastern Resource Centre? The Eastern Resource Centre is earmarked to receive an upgrade including the creation of a large student Hub on the ground floor with informal study space, the refurbishment of the upper levels of the building, and a new atrium linkway that will connect and expand the library into the Doug McDonnell Building. The Doug McDonnell Building will also have food and retail outlets and more informal study space for students. Most importantly, the library will be highly accessible. Will the current food and retail tenants in Union House move when the Student Union does? The University is developing a campus-wide Food and Retail Strategy that will provide a comprehensive plan for the University’s future food and retail offerings. There is no link between the University of Melbourne Student Union's relocation to the Student Precinct and the current commercial tenancies in Union House. How will Student Union's space requirements be accommodated? If the University of Melbourne Student Union requires additional space for a new service, approval for this additional space in Union House may be granted where it is appropriate to do so. However, if the Student Union intends to deliver the new service in the future and for this service to be supported by the New Student Precinct facilities, approval will need to be sought from the University in the form of a Business Case. Where additional services and associated space is approved by the University, the functional and/or space requirements will need to be negotiated with the Student Precinct Project, recognising that the accommodation schedule for the Project has been set. What if the Student Union require additional space in Union House before the relocation? Under the new model of corporate service provision to student organisations, all requests for additional space to support existing operations and services are to be made through the University’s Space Management portfolio. Approval will be granted where it is appropriate to do so, recognising that Union House is part of the overall University space portfolio and may need to support other University activities. All requests will be considered on a case-by-case basis. What will happen to Union House when the Student Union relocates? The University will seek to redevelop the site of the current Union House and have commissioned an urban design framework and heritage assessment that looks at the architectural, cultural and social aspects of the building, to identify how the heritage and green spaces of the surrounding areas are respected and retained through a redevelopment. The Urban Design Framework will ensure that any future redevelopment of the site remains true to the campus’ character; aligns to the strategic objectives of the University’s Campus Development Framework that will guide the planning, design, and development of the Parkville campus to enable an inclusive, dynamic and engaging campus experience; and to ensure that heritage elements of the site are retained and respected. The current option for the site being considered by the University is the development of a Science, Technology, Engineering, Maths and Medicine (STEMM) teaching precinct, inclusive of a Life Sciences research facility, to transform the way STEMM is taught on the Parkville campus. In recognition of Union House’s significant history and place in the hearts of current staff, students and alumni, a program of arts and cultural events, and socio-cultural historical initiatives has been developed by the University of Melburne Student Union and the University. Updates on these initiatives and activities can be found on the New Student Precinct website. When will the Student Union be moving from Union House to the Student Precinct? The New Student Precinct will be completed in stages, with the anticipated completion in 2021 - 2022. UMSU, UMSU International and their associated services and activities are scheduled to relocate to the New Student Precinct in late 2020 - 2021. It is important to note that there are variables that may affect the timing of the Project and consequently the relocation of the University of Melbourne Student Union into the Precinct. What will happen to Lot 6? Lot 6 will cease trading and the building will eventually be removed altogether. The removal of Lot 6 provides an opportunity to reveal and reinstate the 1888 heritage north facade around a new courtyard space. This will enable a renewed relationship with the unified internal landscape and strengthen the precinct heritage core of the Student Precinct. With new food and retail outlets coming to the Precinct, student and staff will not be short on options. In the meantime, keep an eye out for activations around the site including pop-up food retailers. Why is the Alice Hoy Building scheduled for removal? The removal of the Alice Hoy Building, which represents a poor connection to the internal landscape of the Precinct from Monash Road through to Swanston Street and having little heritage significance, will allow for the construction of a new Arts and Cultural Building. Recognising the centrality of these facilities to student experience and life on campus, this new development will help anchor the Precinct as part of the University’s cultural estate, on a primary interface with the city and linkages to our Southbank Campus. The location of the new Arts and Cultural Building will connect the Precinct with Melbourne’s Arts Precinct, forming part of the cultural spine that links the Ian Potter Gallery, Carlton Connect, Australian Centre for the Moving Image, the Arts Centre and the National Gallery of Victoria, through the city of Melbourne. Will the development of the Student Precinct mean my fees will increase? The Project has been funded from the University's capital funds and therefore will not affect or increase fees for our students. Who pays for the maintenance of the Student Union's current space in Union House? The University will continue to fund required maintenance of existing infrastructure in the Student Union Building. What if space allocated to a Student Union service requires upgrades or refurbishment? The University will endeavour to ensure that all space used by the University of Melbourne Student Union in Union House is compliant. Substantial works to existing and/or additional space will not be supported recognising current constraints on the existing building. Minor works will be considered if the investment improves space utilisation (for instance, installation of additional data network outlets in shared office space) with costs charged to the Student Union. How much will the Precinct cost? The New Student Precinct Project has been funded from the University's capital funds. The entire Project cost is $229.7M and will be delivered in two phases, noting phase 2 is subject to business case approval.